Birding is a great way to introduce children to the wonders of nature. Kids are naturally curious, and they're eager to explore and observe what's going on around them. And birds are endlessly fascinating and entertaining to watch. So bird-watching and kids go well together! Here are a few tips and resources that will help you introduce your children to the wonderful world of birding. I'm also including a list of books and other visual-aid materials that you can use to help your child learn more about birds in your backyard and in other natural areas. It's easy to spark children's interest in watching birds, especially if you start them out by looking at the birds in your own backyard. Even very young children are curious about what's going on outdoors, whether they're looking through the windows from inside the house or while they're outside. And birds are easy to observe and endlessly entertaining to watch! Your children can see them as they fly around the yard, hop on the ground, sit on a telephone wire, feed from bird feeders, or use a bird bath. You and your kids can enjoy watching and learning more about birds during all seasons of the year. What colors are the birds that they see? How big are different birds (compared to each other, or to other objects nearby)? Where do they see the birds (bird feeder, ground, trees, electric wires)? What birds do they see just once in a while? What kind of behavior do they see in the birds? How do the birds interact with each other? What kinds of songs and sounds to the birds make? Older kids can keep a log of their observations, including their answers to these questions. Younger children can make simple drawings of what they see, or have you help them record their observations. Very young kids can be asked simple questions, such as "Where is the red bird? ", "Which is the biggest bird? ", "What do you think that bird is doing?". Keep their birding sessions short. An easy way to kill chidren's enjoyment of nature, including bird-watching, is to insist they spend more time on it than they want to. For younger kids, keep it to a few minutes. Older children with longer attention spans might be easily engaged for longer. Text and illustrations introduce the world of birds from eggs to flight, from songs to nests. In between outdoor bird-watching sessions, your children may enjoy reading about wild birds and looking at pictures of birds that they might see in their backyards. The books listed above are representative of the good quality bird books geared toward young birders. Also note the journal where kids can record their observations of the birds they've seen. 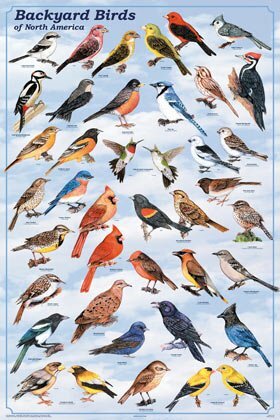 I especially like this poster (right) of North American Backyard Birds. Many are common to where I live. Kids like to see pictures of birds. They can start learning the names of the birds they see in their own backyards by looking at different wild bird photos and drawings. Do you live in the eastern half of the United States? Here are pictures and information about some of the common birds that I see in my own backyard, in southeast Michigan. You and your kids will see more birds in your yard if you put out bird feeders. Let your kids help you clean and fill the feeders. You can talk about how important it is to keep the bird feeders clean, so the birds don't get sick, and to keep feeders full so the birds continue to come back. Have your children observe what kinds of birds are attracted to different feeders and food. Also have them observe feeding behaviors of various bird species. Birds are also drawn to water, so a bird bath can also make a nice addition to your back yard. Certain birds will gladly make nests in bird houses that you put out. If you're handy, you and your child can make your own bird houses and bird feeders. Your kids will love watching birds at these feeders! This mini magnum thistle feeder is made with durable powder coated finish. Drain holes in seed tray. Holds 3/4 pounds of seed. 4-3/4-Inch diameter by 11-3/4-inch height. Tall windowpane feeder for large and small birds. 5.5-inch opening. Easily removes from suction cups for easy refilling. 1 quarts capacity. Measures 12-inch length. When your kids are familiar with many of the common birds in your own backyard, take them out on field trips to see birds in other habitats. Have them tell you which birds are the same as ones they're familiar with, and which birds are new to them. Take along bird guide books geared toward children and see if you and they can identify the new birds. Visit your local park, a nearby field, nature preserve, or a lakeshore. You can talk about how different kinds of birds prefer different habitats. If your kids are used to seeing smaller birds in your yard, it will be fun to take them to see larger birds, such as ducks and geese. 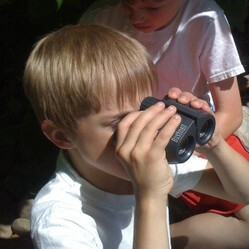 Have your kids record their observations as they did when they were looking at backyard birds. You may be able to find birding programs at nature centers that are geared toward children. It's fun to go out with other families on a guided tour to find new birds and learn interesting facts about them! Your kids will enjoy seeing birds up close and personal by looking at them through binoculars. You don't need expensive binoculars for your kids. Choose a pair that is durable and can withstand accidental dropping. Have your children practice finding backyard birds in the binoculars before taking them out on a birding field trip. Watching the birds in our backyard is one of my favorite hobbies. Do you know what kinds of bird feeders and bird food attract different birds? Many American Robins migrate south during the winter, but not all. Ha! I've never heard of twitchers before :-) I guess we met a "twitcher" yesterday afternoon -- he had come out to see if he could find a rare white-eyed vireo that apparently had been spotted in that area. Thanks. In Britain we speak of twitchers, but serious birders object to being called twitchers, as twitchers are those who only rush out to see rarities, such as occasional visitors to our shores. Hi frankbeswick, "birding" is often used here in the U.S. by those who are more serious, and "bird watching" is considered a more casual activity. (My mother always corrects me when I ask her if she's been doing any bird watching....) Others (like me) use the terms interchangeably. Well, while my kids are old enough not to need this advice,[youngest 22] I have learned a new word. We Brits call birding bird watching, and I had not heard the term birding before. As I teach some English every new word is useful. Thanks, ohcaroline! Yes, the coloring pages can be very useful for kids in learning more about backyard birds! Bird feeders are such a neat way to get kids into birding. I like the coloring book ideas too. Thanks, pkmcr. Kids can be enthusiastic birders! Fantastic and a great way to get kids interested in the natural world around us.